In looking for solutions to the high cost of livestock feed, the Hawaii Department of Agriculture (HDOA) held a workshop in August 2012 with the Oceanic Institute, which is conducting a pilot program to grow animal feedstock in Hawaii. Feedstock is one of the most costly expenditures for livestock operations and one that has historically prevented local livestock operations from being competitive with Mainland operations and commodities. 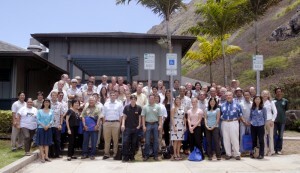 HDOA Chairperson Russell Kokubun, called industry representatives from around the state to gather ideas and suggestions targeted at overcoming the many challenges to raising feedstock in Hawaii. The following include information on the workshop, as well as notes from the various working groups. A powerpoint presentation by Anthony C. Ostrowski, Ph.D. from the Oceanic Institute is also provided. For further information, contact Ken Kakesako at 973-9552. Presentation on Aquatic Feeds & Nutrition, Warren Dominy, Ph.D., Dong-Fang Deng, Ph.D., Zhi Jong, Ph.D.